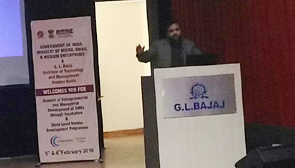 G. L. Bajaj Institute of Technology and Management organized an event for the Incubator Awareness among the students in association with MSME on 5th Feb, 2016. Event has been attended with the crowd of more than 250 students and faculty members of G. L. Bajaj including Director of institution. With the welcome speech by Honorable Director, Dr. Rajiv Agarwal, event has been initiated for addressing students by the eminent speakers on the desk and Asst. Director of MSME, Dr. Amarnath. In the session, Dr. Surjeet Banerjee, Scientist-F, Department of Science and Technology, address students about the process for thinking of product as innovative product. His guidance for the approaching of right path for the development of innovative product provides a light in the darkness of their future to be an entrepreneur. Mr. Vatsal Asthana, a successful entrepreneur, guides students with his experience and difficulties faced by him to become an entrepreneur. His views and way of expressing his words, makes the session interesting among the students and became one of the favorite speaker for the day. In the Second half, Dr. S. P. Mishra with the bundle of knowledge and experiences provided his approach for consulting students and guiding them. In the end of the session, Dr. Amarnath provides the brief description about the policies for the support of students to become an entrepreneur. Support includes consultancy, guidance and financial support for the innovative incubators.